LAKEWOOD, Colo. — A Lakewood man says he's being pushed out of the place he's called home for nearly 50 years. Frank Perez says the city’s codes enforcement division is making him clean-up and tear down structures that have existed for decades. He believes the city wants him out because his property sits on prime real estate. His property sits just beyond the shadows of downtown Denver, along Mississippi Avenue between Sheridan and Wadsworth in Lakewood. "I came upon this property, and I’ve been happy here nearly my whole life," Perez said. Perez Jr's small five-acre horse ranch sits in the middle of Lakewood, which he bought on a handshake and a hand full of cash. "For $50 down and $50 a month," Perez said. "Raised my boys here." 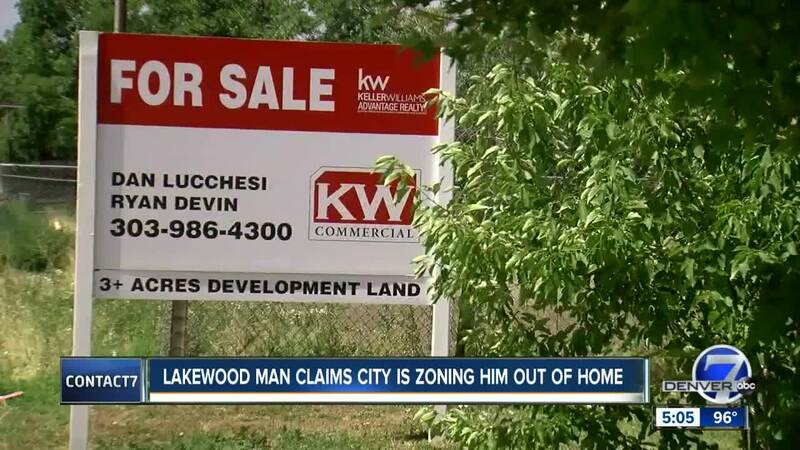 But within the past few months, the City of Lakewood has been all over him to clean up his property. "I think I've been harassed by the code enforcement people," Perez said. His son, Joaquin was born and raised here. The City of Lakewood says its actions are justified. For starters - the city says Perez was allowing two people to live in structures on the property that had no electricity or running water. Also, City of Lakewood spokeswoman Stacie Oulton says some of the horse stables weren’t up to code either and posed a serious safety risk to the horses housed in them. Oulton also says, at one point, Perez had 21 vehicles on the property when city code only allows seven. The property does sit on prime real estate - and could be a gold mine for developers and the city's tax base. For Perez, compliance with city codes has been a nightmare. "$30,000 in labor and trash invoices for dumping all my equipment,” Perez said. “All my equipment - I've just sold for peanuts on the dollar just to please them. And, I don't think it's right." Oulton said it’s never the city’s intent to cite or fine residents for code violations. She says Lakewood made every attempt to work with Perez on getting the property fixed up. The city also suspended fines in Perez’s case and has given him an extension to come into compliance.